If you follow, you know I’ve been complaining a lot suffering from various “ailments” with just about every joint on my body, some long-standing, others recent, so thank you for bearing with me. The docs, though, refuse to consider my brilliant idea of amputating the right side of my body and just keep giving me cortisone shots and sending me to therapy so I’m on the mend. And I will be posting more Bargain Meal of the Week recipes and of course more soup – Y’all gotta know by now I love me some soup! But in the meantime, take a look at this quiche! Simon Pearce Quechee Quiche IS an over the top indulgence! It is a Quiche like no other and one I’ve been wanting to make for a long time. I don’t even know if this should be called a Quiche; it’s almost more like a Cheddar Pie, so if you love a good, sharp Cheddar Cheese, you’re going to love this Quiche. As you can see, except for that it’s round, pie-shaped and has a pie crust, it doesn’t even look like most quiche and sure doesn’t taste like it. I’ve thrown down some pretty good Quiche in my day (like this Cook’s Illustrated Quiche Lorraine) but I’ll be making Simon Pearce Quechee Quiche over and over. For one thing, it’s super easy and low effort, not fussy at all (and we did cheat with a store-bought crust) and it’s just a big, beautiful quiche. It really reads as a meal, especially with a few salad greens, or would be perfect with a slice or two of melon or a little fruit salad for brunch. The Simon Pearce Quiche is versatile too. We used bacon and a little spinach, but a little ham tucked inside would be excellent. I can see taking a completely unexpected departure and using a diced smoked sausage, instead. That I think would be a man-pleasing quiche for sure and with all this cheddar would be a great combo! I have been so lucky that I have friends and family who have been helping me out, and this quiche actually came about because my friend, Rosanne, invited me over to cook together and wanted quiche. I think my friend may be a little obsessed with quiche. You might remember last year she came over to my house and we made this marvelous Broccoli, Ham, and Cheese Quiche? Well, you probably don’t remember, but I do, lol! In that cooking session, we also made my 30 Minute Medium Rare Instant Pot Roast that we turned into copycat Panera’s Steak & Cheddar Paninis. And we made Roasted Sweet Potatoes & Brussels Sprouts with the most marvelous White Balsamic Vinaigrette that brightened it up and set those veggies off to perfection. We’re planning more cooking sessions together. And I have to stop and give a shout out to her husband, David, who along with Rosanne is a treasured friend, and David is an excellent cook. I’ve learned a lot from him over the years. He basically indulged us by whisking away and washing each bowl, pan, and dish as we dirtied them! I was in heaven – I had a sous chef to boss around and someone to clean up after us, lol! Simon Pearce Restaurant used to keep their recipes on their site but removed them which saddened me to no end (I have another Simon Pearce recipe here, Connemara Soup with Bacon or Corned Beef and have talked about their Guinness Stew on this post for my Beef & Guinness Pies). Luckily the recipe for Simon Pearce Quechee Quiche has been posted several times, and we used the recipe from New Hampshire Magazine as a base. Other than the store-bought pie crust, we had to tinker a bit with the recipe to make sure it was going to all fit in the deep dish pie pan, and the pie pan we used was just slightly larger than the standard deep dish pyrex. I tell you what, pies and quiches are getting larger all the time and those pie pans reflect that! And beyond using the largest pie pan we had, I built the edge of the pie crust up, over the top edge of the pan. The recipe calls for two pounds of grated Cheddar. Yep, two pounds! We grated on the large holes of a box grater and put in quite a few small crumbly pieces which was lovely in the quiche and didn’t all melt away, but used considerably less than two pounds. I can’t even give you an exact amount because we had so much grating going on and besides, the amount of cheese you’re going to use is going to depend on how much you can fit in your pie crust! Keep in mind that 8 ounces of block cheese is about 2 cups, grated. I’m estimating that we used a little over a pound of Cheddar, nowhere near the 2 pounds. You’re going to layer a good amount of cheese on the bottom of the crust, I think I put about one and a half to two cups of cheese on the bottom. Then the goodies, whatever you decide, goes in the middle, then more cheese, however much you need to fill to about 3/4 inch below the top of the crust. Make a little well in the center of the cheese and slowly pour in that rich custard, as best you can. Use a fork to nudge the cheese around, trying to keep it evenly distributed as the custard goes in. We had just a smidge leftover, so I would suggest cutting the eggs back to seven and using 1 3/4 cups of cream. If your quiche isn’t fully filled, then just whisk the last bit of cream and egg together and add it in. I loved the spinach in this quiche; it cut some of the richness. We used about 1/2 a package from the store, about four good handfuls, lightly sauteed in a touch of oil. We also found the quiche to be salty with all that cheese – I cut back to 1/2 a teaspoon in the recipe. The Simon Pearce Quiche didn’t need nearly the time stated in the recipe to cook, probably because it was not as large as the restaurant version and had I not caught it as I did, about a half an hour before the recipe stated it would be done, all would have been lost! We used a pie shield. Next time, I’ll lightly cover the whole quiche with a sheet of aluminum foil when the top is lightly browned. When you’re talking this much cheese and cream and pie shells, along with bacon, you are not talking a dirt cheap recipe. But you are talking a big, hearty, filling quiche, and that’s not a bad value and it could easily be breakfast for dinner. Leftover ham, rather than bacon, will be more cost-effective. Eggs are always pretty inexpensive and are cheaper if you shop at Aldi or Costco, and if you don’t have one available, shop holiday sales where eggs are usually heavily discounted and stock up. Eggs keep for several weeks and we have enough holidays that you can save a few bucks with this strategy. The Cheddar you use can be common grocery store Cheddar or any variety you like, and of course the better the cheese, the more intense Cheddar flavor you’re going to get. The grocery store sharp Cheddar has really improved over the years and that’s what we used. Watch for it on special and stock up. Stick with a sharp Cheddar, though, or the results might be less than stellar…I’m picturing a melty, gooey mess and that’s not the result we want. I love a good homemade pie crust and take the time if you can whip one out, but there’s so much big flavor in this quiche that the crust takes a backseat. Store bought, side by side pales in comparison to a homemade but makes Simon Pearce Quechee Quiche a lot more do-able. Price wise, it’s a toss-up between homemade and storebought and if your crust is bought on sale it might actually be cheaper – on the downside, the ingredients are a bit dismal. Note: I didn’t make the crust in the recipe, so can’t comment on it, but it reminds me of my Irish Grandmother’s Pie Crust so I’m sure it must be good! Do read notes in Making Simon Pearce Quechee Quiche in the body of the text before proceeding with the recipe. There are a lot of variances depending on the size of the pie pan to consider. Use your largest 9″ deep dish pie pan. Have a sheet of aluminum foil ready to act as a pie shield. Cut butter into small pieces. Using a pastry blender or two knives, cut the butter into the flour until the mixture resembles coarse crumbs. Add egg and ice water and mix until dough forms. It should be soft, but not sticky. If crumbly, add a splash more water to hold together. Turn the dough onto a lightly floured surface and let rest for 20 minutes. Roll out the dough to a circle a bit larger than the baking dish. Line the baking dish with the dough, bringing the dough up and above the edge of the pie plate and crimp the edges. For a flakier crust, refrigerate the dough-lined baking dish for at least one hour. When ready to fill pie crust and bake, preheat oven to 300 degrees F.
The filled quiche will be very full; place the dough-lined baking dish on a baking sheet for easy transfer into the oven. In the bottom of the baking dish, fill with about a good cup and a half to two cups of grated cheese, enough to cover the bottom of the pie crust. Place filling of your choice on top of the cheese. Layer the remaining two-thirds of the grated cheese on top of the filling, or enough to come up to 3/4″ below the top of the crust. In a separate bowl, mix eggs and cream together and season with salt and pepper. Create a well in the center of the cheese and filling mixture in the baking dish and pour in the egg mixture, using a fork to nudge the cheese as needed and keep the cheese evenly distributed. Fill to about 1/2 inch below the top of the crust. See notes in post text; it is possible you may not want to mix up the full amount of eggs and cream, depending on the size of your pie plate. Bake for one hour, then rotate the tray and baking dish and cook for an additional 10 to 30 minutes or until a knife inserted halfway between the edge and the center of the pie comes out clean with just a bit of clear moisture. Be prepared to watch the quiche and place a sheet of aluminum foil lightly over the top when it is golden brown, about 45 minutes in. 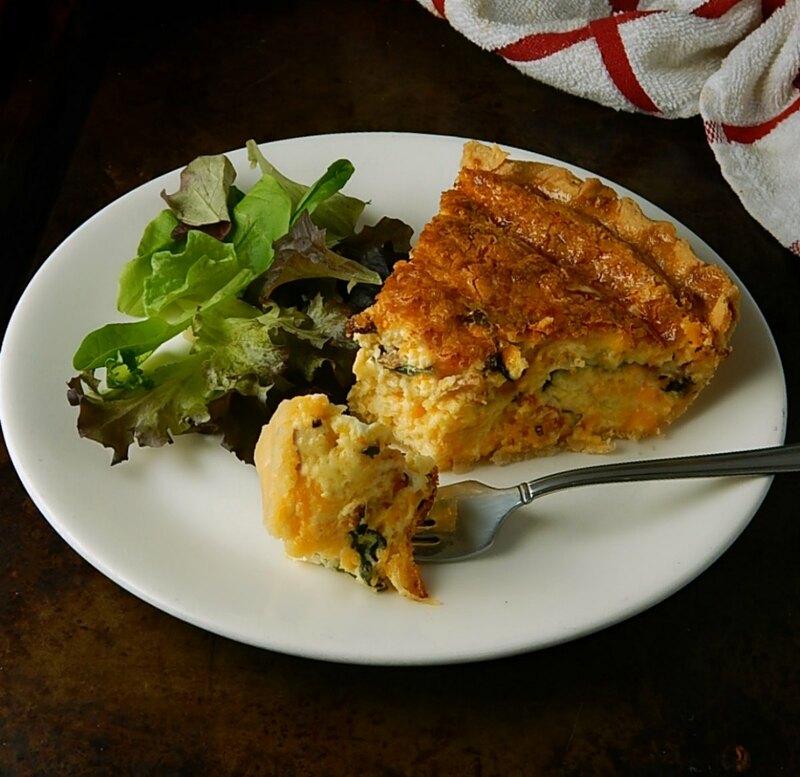 Allow the quiche to rest for 10 minutes, then serve immediately with a few lightly dressed greens or fruits of choice. Spinach: we used about 1/2 package of spinach, about 5 ounces, sauteed in a touch of olive oil until wilted. Bacon: we used 8 slices, about 1/2 package. Recipe adapted from Simon Pearce via New Hampshire Magazine. I’ll be sharing my Simon Pearce Quechee Quiche at Fiesta Friday #260, hosted this week by Diann @ Of Goats and Greens and by Moi! Stop by and visit and see what this special link party is all about. This entry was posted in Click here for Bargain Meals, Click here for Fabulous Food Posts and tagged Bacon, Breakfast or Brunch Dish, cheddar, Cheese, Eggs, Ham, Pie Crust, quiche, Simon Pearce. Bookmark the permalink. Minus 10 here this morning, and I had to get out to the chickens then. Brrr! To respond to the other person who mentioned southeast Louisiana… I went to a conference in late June in New Orleans… simply could not stand the heat nor the humidity there, I rank this cold slightly above that other extreme!!! (and, here, it doesn’t last as long…) You can always put more clothing on…. At any rate, this quiche looks rich and awesome, I will book mark this one. Thanks for sharing AND co-hosting at Fiesta Friday! My pleasure, thank you for cohosting with me, too! You can always put on more clothing but only take off so much. I gotta say, heat makes me feel ill sometimes but cold always energizes, even if it means you gotta move fast, lol! The quiche is awesome! Did you go to the big blogger conference? My parents live just across the river from Simon Pearce in Quechee!! I adore their restaurant (and their entire store and glass blowing studio, such a fun trip to make! ), and have loved everything I’ve eaten there!! I told my daughter she should take a look at it – she’s picking out stemware. Me, I’m all about down sizing these days! That is one cheesy looking pie you got there. A quiche maybe, a luscious carb pie, absolutely. Must admit I’ve never heard of Simon Pearce, but I jumped over for a look. I could spend some serious coin in there. Ah, the joy of being kitchen boss for a day. When entertaining we rotate, when Eva cooks me Sherpa, when I cook Eva’s Sherpa. Works well for us. Ron, it was an experience! Not too carby, but then I have a habit of eating pie and leaving the crust on my plate! I’d love to spend time (and the money) at Simon Pearce. When I looked at the menu I was impressed that there were classics but each dish has an extra little special twist! Their Vermont Cheddar Soup is on my list to make! Lol at Sherpa! It’s sounds like you have the perfect tandem team going on! That is one beautiful quiche! If you use a Pillsbury pie crust, do you prebake it at all? Or is that not necessary? That’s a great question, because I usually pre bake on most quiches, but not on this one – the cheese seems to keep the crust from getting soggy. I almost prebaked it out of habit but we were in a bit of a hurry, so I’m so glad I didn’t. It was perfectly fine w/o that extra step! That’s COLD. It’s similar here. I felt silly after I said that because I’m a wimpy lady, lol!! But I’m going to try that after I recover from this one!! 2 pounds of cheddar is insane (and I am speaking as a Brit who comes from Cheddar country)…bet the quiche tasted heavenly though! I know! We were looking at the pile of cheese and the pan and shaking our heads! I’m guessing the recipe wasn’t cut back properly from the restaurant sized one. It was heavenly though! Very good warm out of the oven and just as good cold this mornng because I didn’t even bother to pop it in the microwave. -11? OUCH! That’s why I live in Southeast Louisiana. I’m 54 years old and the coldest it’s ever gotten here was 17. And THAT was too much for me! By the way. The quiche looks delicious! Oh yeah. You haven’t lived until you’ve experienced a New Orleans summer! And yes, I knew about the riverboat thing. I’ve always dreamed of taking that trip! I think there is a cruise company that offers it.